Spirit XBR55 Recumbent Exercise Bike is a superb recumbent bike known for its durablility, comfortability, and smoothness. It has some amazing features also such as easy adjustments, bright LCD screens, a cooling fan, and mesh back seats other than ten programs with extensive console feedback. Spirit XBR55 Recumbent Exercise Bike also comes with audio jack and speakers, remote resistance controls, an adjustable back rest, and wireless heart rate monitoring. Cooling Fan-Cooling fans that swivel are standard on all of our fitness bikes. This may just be the reason you extend your workout by a few minutes. Foot Pedals-2 degree; of inversion of each pedal places your body into an anatomically correct position throughout the workout. Contact Heart Rate-Conveniently located heart rate grips allow you to monitor your pulse. This allows you to increase or decrease the resistance, based on where your heart rate is. Console Feedback-All pertinent information is displayed during the workout and a summary of accumulated data scrolls when you have finished. Comfort-The seat is a high durometer foam pad, while the back rest is a nylon mesh that allows air flow for added comfort. ToughTrain 3.0 out of 5 Go for it you won't regreat. Would be a worthy deal at this price. *Note: Most of the sites, stores or shopping portals listed above sell Spirit XBR55 Recumbent Exercise Bike with discounts and other exciting offers. 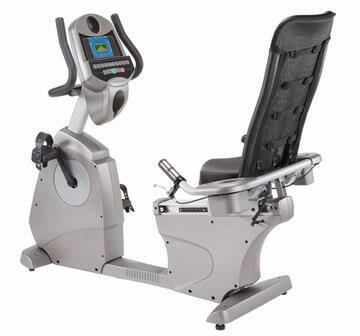 There is a possibility that the some of above websites are not selling Spirit XBR55 Recumbent Exercise Bike now. Toughtrain.com is not liable for such cases or instances. Also we do not recommend any seller for Spirit XBR55 Recumbent Exercise Bike and a buyer should buy from where he/she gets best deal with quality of products, service and on time delivery (shipment). Its a average kinda exercise bike coming under this range. Instead you can look for some other brands, most of them have better specification and attractive looks. But its also true that the service facilities of Spirit Fitness is amazing. Once had an issue with its motor and a technician visited my home just after the day i registered my complaint. Can i extend its warranty, after the expiry of its warranty period….? Is the seat comfortable ??? and can it be adjusted ??? I am bit short (5’0″) so was worried. Will it a suitable one for me or should i look for a upright bike. For Doris – I just tried out the Spirit xbr55 at a showroom today and it is ideal for shorter people. Although I am tall, my sons are 4’11” and 4’6″ and they could both comfortably use it. That was a big selling point for me, since it will get more use and the seat/back adjustments are so smooth that it makes it easy to switch positions. Below 4’6″ would be pushing it, but at 5’0″ you’ll be very happy. It’s also ideal for taller people. On some recumbents, my knees hit or nearly hit the console/ hand holds because my legs are so long, but on this one, my knees have several inches of clearance. I won’t buy a recumbent without trying it out first and this one is excellent for both short and tall people. Very comfortable and quiet too. I was impressed.